Happy Canada Day! Local wine with Flat Rock Cellars, Cameron’s Brewing Company and Peapod Cuisine. Simply “LIKE” The Wine Ladies Fan Page and answer the following question. Champagne is made predominantly with three grape varieties. Although the majority of Champagne is ‘white’ in colour, two of the main grapes used are red skinned . The third grape used is Chardonnay (white skinned) Which 2 red grapes are used to make Champaign? Winners to be picked Sunday July 3rd, 2011 at noon and posted on The Wine Ladies Fan Page. Good luck everyone! Watch The Wine Ladies TV! 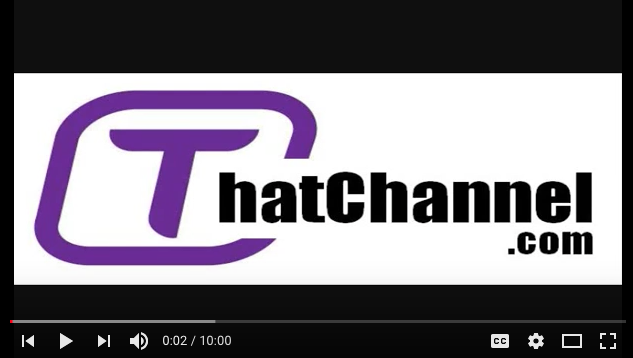 Wed June 29th at 2:30PM -3:30PM on ThatChannel.com Happy Canada Day. Eh? What better way to celebrate Canada’s 144th birthday this year than with a Canadian bounty of award winning wines. All locally grown food and a true local crafted Canadian beer. 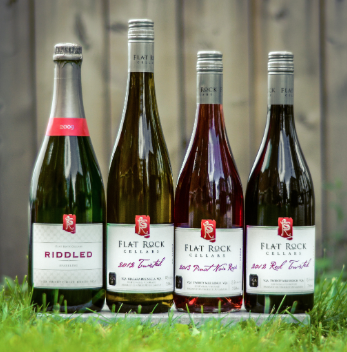 Our guests this week will help us celebrate in style as we welcome winemaker Ross Wise, originally from New Zealand now working his magic at Flat Rock Cellars. 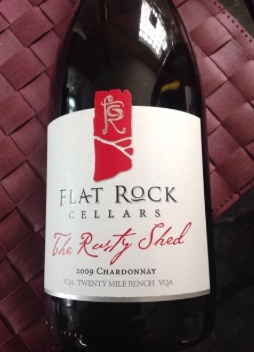 We’ll be tasting the 2009 Rusty Shed Chardonnay that just recently was awarded the only GOLD for a Canadian Table wine at the International Wine Challenge. We will also discover more about the upcoming i4c – International Cool Climate Chardonnay Celebration coming up in July. Also in studio, Australian professional chef Adam Hynam-Smith of Peapod Cuisine, located in St. Catharine’s. Peeped Cuisine with a focus on using local produce to create delicious and healthy dishes. And,what more Canadian then beer eh? We welcome president, entrepreneur and marketer Bill Coleman of Cameron’s Brewing Company. A brewery a true craft brewery that has been passionately brewing their all natural ales, and lagers since 1997. Brewed by a connoisseur,not an accountant. Aw Shucks! Nothing can compare with party atmosphere that results when you co-mingle boisterous bubbles and the humble oyster. Rub shoulders and talk barrels with wine producers from 15 international wineries and dance the night away to the sounds of local musicians on the Green Roof Patio, overlooking our estate vineyards and Lake Ontario. 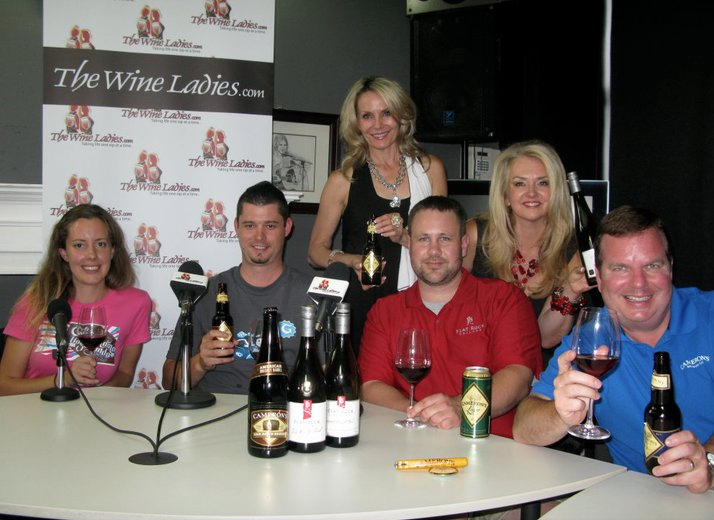 If you missed last week’s show not a problem, please visit For all The Wine Ladies TV podcasts and archived shows visit The Wine Ladies TV Show and ThatRadio.com from anywhere and anytime. Raise a glass to our “go to kitchen guy” John Anthony Vanderkolk of Kitchen Designers Plus. The kitchen is the heart of the home, where everyone comes together, with great food, wine and lively and engaging conversation. The beautifully designed and decorated kitchen can add value both to your home and the enjoyment of it. Meet John Anthony Vanderkolk: kitchen designer and proprietor of Kitchen Designers Plus our new “go to kitchen guy” a.k.a. “Johnny V”. 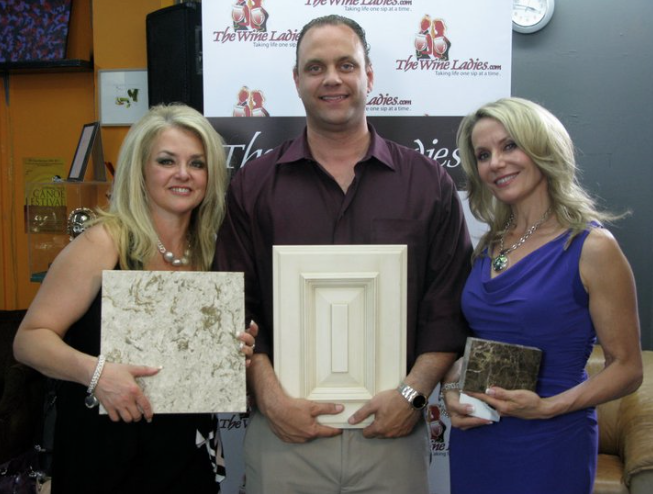 Be sure to follow The Wine Ladies TV with regular tips from Johnny V on the do’s and don’ts, and how to make your kitchen renovation your dream come true. For all the tips on the perfect kitchen view here. SAVE THE DATE! September 22nd, 2011 East Meets West Wine Tasting Dinner with The Wine Ladies and Celebrity Winemakers . A fundraiser in support of ArtHouse. Join us September 22nd 2nd, 2011 for a spectacular evening of sensory sensations, set in the “singingly stylish” 3 S’s Restaurant located in beautiful downtown Oakville, Ontario. “East meets West” as celebrity winemakers from the spectacular Okanagan Valley, wine region showcase their wines in a friendly battle with the winemakers and wines of the Niagara wine region. Get to know the face behind award winning wine labels from both wine regions, the crown jewels of the Canadian wine industry as celebrity winemakers guide you through the individual wine and food pairings. Truly an evening to savour for all of the senses! Enjoy exquisite wines and scintillating food to mesmerise your palate and magnificent music for your ears and art for your eyes too. Be entertained with the sensationally talented “3 S’s singing servers”. Click Here or to purchase tickets: Call The Wine Ladies at 905-338-6797 or online here. Event Details Date: Thursday September 22nd, 2011 Time: 7:00 pm – 10:00 pm 7:00pm- 7:45pm: Red carpet and reception (wine, sparkling wine and appetizers) 7:45 pm-10:00pm: 4 course dinner matched with wine 2 wines from each region, your hosts The Wine Ladies and guest winemakers from will lead you through a wine tasting. Place: 3 S’s Restaurant, Oakville, Ontario Cost: $125.00 (HST and gratuities included) Your chance to win and visit a slice of golf heaven! Go now and get access to our “Nine-wine-dine opportunity! A $150.00 VALUE! Click here to enter. NK’Mip Cellars and delish iconic wine Mer’riyn definitely delivers. Nk’Mip Cellars (Pronounced in-ka-meep) is North America’s first Aboriginal owned and operated winery. 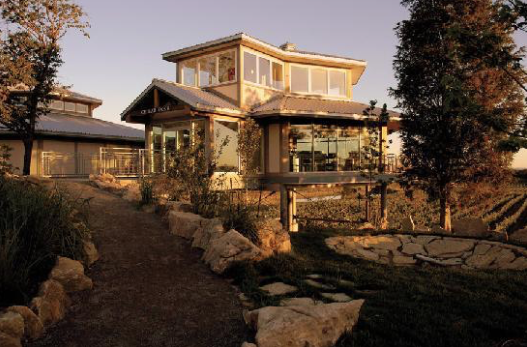 The winery is located in the far south of the Okanagan in B.C. Join us as we visit the incredible history of the Osoyoos Indian Band and the role they play in producing these award winning wines. Indulge in the stunning architecture and the native art and artifacts. Embrace the passion of winemaker Randy Picton as he reveals the story and the flavour profile of the iconic wine Mer’r’iyn, meaning marriage. A blend of the 5 grape varietals that typify the great wines of Bordeaux. An indulgent, fascinating and delectable tour of “Canada’s most visited winery”, Summerhill Pyramid Winery in Kelowna, B.C. Steve Cipes, founder and owner explains the theory behind the pyramid, the resting place for his barrels, “The Summerhill Pyramid is second only to the Great Pyramid of Egypt for alignment and precision” he explains the effect this chamber has on the wines. Engaging, passionate, colourful. Our brief tour is Complete with sabering Cipe’s award winning sparkling wines set against the backdrop of the majesty of the Okanagan. Insert pictures of pyramid winery stuff here. Your House. It’s anywhere you go to enjoy life, the company of others, good food and great wine, House Wine Company. Where you can just enjoy life’s simple pleasures without concern for details. https://www.thewineladies.com/wp-content/uploads/2011/06/Screen-Shot-2018-04-19-at-7.15.22-PM.png 352 347 Susanne Seelig-Mense https://www.thewineladies.com/wp-content/uploads/2017/08/WineLadiesLogoTransparent.png Susanne Seelig-Mense2011-06-28 15:16:002018-05-22 07:57:50Happy Canada Day! 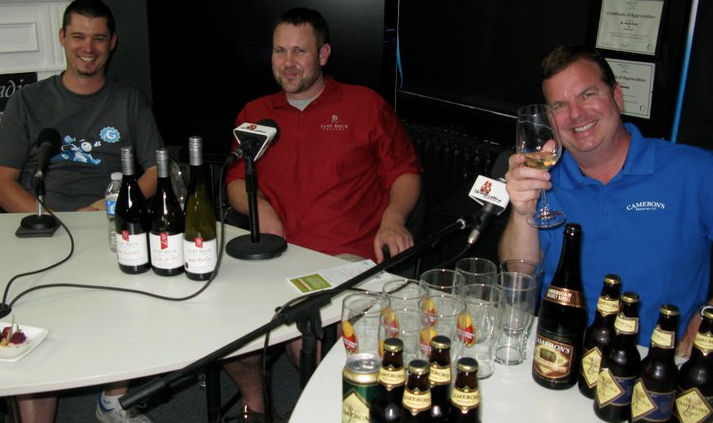 Local wine with Flat Rock Cellars, Cameron's Brewing Company and Peapod Cuisine. To purchase tickets: Call The Wine Ladies at 905-338-6797 or online click here. East Meets West Wine Celebrity Winemaker’s Dinner….with The Wine Ladies ……a fundraiser in support of ArtHouse Join us September 22nd 2nd, 2011 for a spectacular evening of sensory sensations, set in the “singingly stylish” 3 S’s Restaurant located in beautiful downtown Oakville, Ontario. “East meets West” as celebrity winemaker Jak Meyer from Meyer Family Vineyards of the spectacular Okanagan Valley, wine region showcase their wines in a friendly battle with the winemakers of the newest winery from Lake Erie North Shore, Burning Kiln Winery. Get to know the face behind award winning wine labels from both wine regions, the crown jewels of the Canadian wine industry as celebrity winemakers guide you through the individual wine and food pairings. Truly an evening to savour for all of the senses! Enjoy exquisite wines and scintillating food to mesmerize your palate and magnificent music for your ears and art for your eyes too. Be entertained with the sensationally talented “3 S’s singing servers”, a one and only restaurant experience as they showcase songs from smooth n’ silky jazz, snazzy show tunes to classic ballads against the backdrop of an array of special art. The Wine Ladies TV cameras will be there welcoming you and capturing the magic and special moments of this sparkling night. Walk away with your loot bag as a sweet memory of the evening. Our silent auction table will be abundant with an assortment of incredible prizes, featuring something for everyone. The funds raised that evening will are for ArtHouse not-for-profit charitable organization offers cost-free programs to young children, helping them to develop their hidden talents and experience the thrill of creative and artistic expression. For more information watch our promo video here: To purchase tickets: Call The Wine Ladies at 905-338-6797 or online click here. A very special thank-you to our Gold Sponsor Rumi Galleries located in Mississauga, Ontario. Established in 1981, Rumi Galleries is one of Eastern North America’s premier galleries specializing in 17th, 18th, 19th, and 20th century antiques and fine art. With locations in Ontario, Canada and Connecticut, USA and provides clients with exceptional service and taking pride in offering only the highest quality antiques and fine art. With a vast inventory and extensive show space we have something to suit all tastes, ensuring a visit to either of our locations will be a pleasant one. Our outstanding online gallery provides the opportunity to view our full inventory, regardless of its location. We invite you to call upon our expertise when selecting antiques or fine art for your personal collection. About The Wine Ladies The Wine Ladies, Georgia and Susanne founded by entrepreneur sister team in 2003, take life one sip at a time as they share the splendour of food and wine for all and the wonderful lifestyle it entails. Regular national TV personalities, columnists and hosts of their own weekly TV and radio show about wine, food and lifestyle these ladies share their passion and live life to the fullest and without hesitation. Their motto “everything in life somehow comes back to the vine” keeps their audiences entertained and informed. Connect with us on FaceBook. 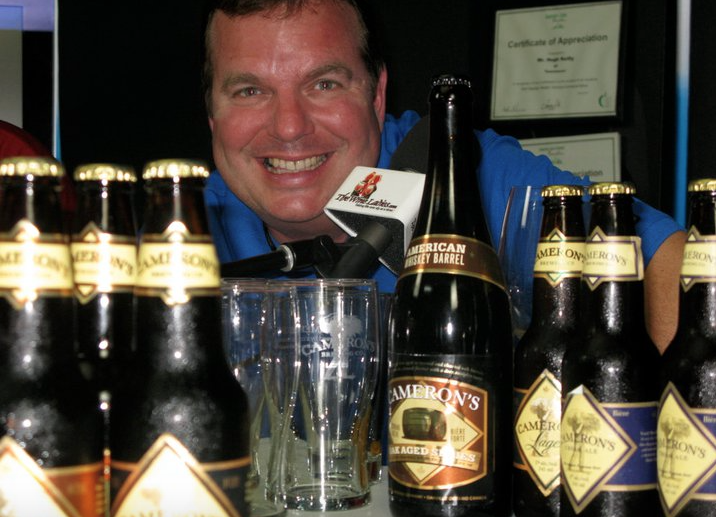 Cameron’s award-winning products recognized over 200 times at local, national and worldwide brewing awards. What better way to celebrate Canada’s 144th birthday this year than with a Canadian bounty of award winning wines, locally grown food and a true local crafted Canadian beer. Our guests this week will help us celebrate in style as we welcome winemaker Ross Wise, originally from New Zealand now working his magic at Flat Rock Cellars, We’ll be tasting the 2009 Rusty Shed Chardonnay that just recently was awarded the only GOLD for a Canadian Table wine at the International Wine Challenge. We will also discover more about the upcoming i4c – International Cool Climate Chardonnay Celebration coming up in July, Also in studio, Australian professional chef Adam Hynam-Smith of Peapod Cuisine, located in St. Catharine’s, with a focus on using local produce to create delicious and healthy dishes. And , what more Canadian then beer eh? Bill Coleman of Cameron’s Brewing Company, a brewery a true craft brewery that has been passionately brewing their all natural. We welcome president, entrepreneur and marketer Bill Coleman of Cameron’s Brewing Company. A brewery a true craft brewery that has been passionately brewing their all natural ales, and lagers since 1997. Brewed by a connoisseur. not an accountant. AW SHUCKS kick-off party! Aw Shucks! Nothing can compare with party atmosphere that results when you co-mingle boisterous bubbles and the humble oyster. Rub shoulders and talk barrels with wine producers from 15 international wineries. Dance the night away to the sounds of local musicians on the Green Roof Patio, overlooking our estate vineyards and Lake Ontario. https://www.thewineladies.com/wp-content/uploads/2011/06/Screen-Shot-2018-04-20-at-10.00.59-AM.png 518 713 Susanne Seelig-Mense https://www.thewineladies.com/wp-content/uploads/2017/08/WineLadiesLogoTransparent.png Susanne Seelig-Mense2011-06-27 20:33:002018-04-20 10:11:35Cameron’s award-winning products recognized over 200 times at local, national and worldwide brewing awards. Thinking of renovating your kitchen? Watch The Wine Ladies TV June 22nd, 2011 2:30-3:30p.m. Raise a glass to our “go to kitchen guy” John Anthony Vanderkolk of Kitchen Designers Plus The kitchen is the heart of the home, where everyone comes together, with great food, wine and lively and engaging conversation. The beautifully designed and decorated kitchen can add value both to your home and the enjoyment of it. We recently met John Anthony Vanderkolk, kitchen designer and proprietor of Kitchen Designers Plus and were so taken with his talent and passion we’ve decided to make him our “go to kitchen guy”. You’ll meet John this week on The Wine Ladies TV, Wednesday June 22nd on ThatChannel.com from 2:30-3:30p.m. Be sure to follow The Wine Ladies with regular tips from John V on the do’s and don’ts, and how to make your kitchen reno your dream come true. Coming soon, John V on “Build It” airing on I Channel, John V will be showcasing his projects from the blue prints to the cabinetry, the granite and the first dinner party. Raise a glass to our new “go to kitchen guy” John V.
Your House. It’s anywhere you go to enjoy life, the company of others, good food and great wine, House Wine Company. Where you can just enjoy life’s simple pleasures without concern for details. Speed dating move over, how about speed tasting? Australia’s First Families of Wine Toronto: May 5th, 2011 Meet Australia’s First Families of Wine, Guardians of the Soil with over 1,200 years of family winemaking. Recently we had the first-ever opportunity to meet the premium producers behind Australia’s First Families of Wine (AFFW) as they showcased more than 1,200 years of collective winemaking at an exclusive media and trade tasting. AFFW’s “Guardians of the Soil”. The event showcased more than 60 iconic wines and rare back-vintages that demonstrate the unique characteristics of cherished vineyard sites from a collective of multi-generational family winemakers who are “guardians of the soil” for 16 Australian regions across four states. It was a really unique experience whereby like speed dating, we moved from table to table with our group of wine media, sommeliers and VIP trade with an opportunity to speak and taste with the principles of these iconic producers. Check out our interviews with Peter Barry of Jim Barry Wines: and Alister Purbick of Tahbilk Winery and Vineyard: from two of these distinguished producers. Look for these wine labels by these amazing producers at the LCBO and Vintages from Brown Brothers, Campbell’s ,d’Arenberg, De Bortoli, Henschke, Howard Park, Jim Barry Wines, McWilliam’s, Tahbilk,Tyrrell’s, Wakefield, Yalumba. To know more about this check this out, Australia’s First Families of Wine. When was your last great drive? Experience authentic Muskoka .Golf and stay with your chance to drive away! Spend a day at the race track. All you have to do to be entered is into the draw is to come and stay at the beautiful post and beam Cottages at Diamond in the Ruff situated in beautiful Muskoka on Nutt Lake bordering The Diamond in the Ruff Golf Course. To qualify for the special rates and to be entered into the draw to win you must book by July 1st, 2011. For details and to be entered to win 1-877-643-3343 or Diamond Cottages. Your chance to win and visit a slice of golf heaven! Go now and get access to our “Nine-wine-dine opportunity! A $150.00 VALUE! Click here to enter. https://www.thewineladies.com/wp-content/uploads/2011/10/s7.addthis.com_static_btn_v2_lg-share-en.gif 16 125 Susanne Seelig-Mense https://www.thewineladies.com/wp-content/uploads/2017/08/WineLadiesLogoTransparent.png Susanne Seelig-Mense2011-06-20 17:17:002011-06-20 17:17:00Thinking of renovating your kitchen? Watch The Wine Ladies TV June 22nd, 2011 2:30-3:30p.m. Thinking of renovating your kitchen? Watch The Wine Ladies TV June 22nd, 2011 2:30-3:30p.m. The kitchen is the heart of the home, where everyone comes together, with great food, wine and lively and engaging conversation. The beautifully designed and decorated kitchen can add value both to your home and the enjoyment of it. We recently met John Anthony Vanderkolk, kitchen designer and proprietor of Kitchen Designers Plus and were so taken with his talent and passion we’ve decided to make him our “go to kitchen guy”. You’ll meet John this week on The Wine Ladies TV, Wednesday June 22nd on ThatChannel.com from 2:30-3:30p.m. Be sure to follow The Wine Ladies with regular tips from John V on the do’s and don’ts, and how to make your kitchen reno your dream come true. Coming soon, John V on “Build It” airing on I Channel, John V will be showcasing his projects from the blue prints to the cabinetry, the granite and the first dinner party. Raise a glass to our new “go to kitchen guy” John V.
If you missed last week’s show not a problem, please visit For all The Wine Ladies TV podcasts and archived shows visit TheWineLadies TV Show and on ThatChannel.com from anywhere and anytime. The kitchen is the heart of the home, where everyone comes together, with great food, wine and lively and engaging conversation. The beautifully designed and decorated kitchen can add value both to your home and the enjoyment of it. We recently met John Anthony Vanderkolk, kitchen designer and proprietor of Kitchen Designers Plus and were so taken with his talent and passion we’ve decided to make him our “go to kitchen guy”. You’ll meet John this week on The Wine Ladies TV, Wednesday June 22nd on ThatChannel.com from 2:30-3:30p.m. Be sure to follow The Wine Ladies with regular tips from John V on the do’s and don’ts, and how to make your kitchen reno your dream come true. Coming soon, John V on “Build It” airing on I Channel, John V will be showcasing his projects from the blue prints to the cabinetry, the granite and the first dinner party. Raise a glass to our new “go to kitchen guy” John V.
Meet Australia’s First Families of Wine, Guardians of the Soil with over 1,200 years of family winemaking. Recently we had the first-ever opportunity to meet the premium producers behind Australia’s First Families of Wine (AFFW) as they showcased more than 1,200 years of collective winemaking at an exclusive media and trade tasting. AFFW’s “Guardians of the Soil”. The event showcased more than 60 iconic wines and rare back-vintages that demonstrate the unique characteristics of cherished vineyard sites from a collective of multi-generational family winemakers who are “guardians of the soil” for 16 Australian regions across four states. It was a really unique experience whereby like speed dating, we moved from table to table with our group of wine media, sommeliers and VIP trade with an opportunity to speak and taste with the principles of these iconic producers. Check out our interviews with Peter Barry of Jim Barry Wines: and Alister Purbick of Tahbilk Winery and Vineyard: from two of these distinguished producers. Look for these wine labels by these amazing producers at the LCBO and Vintages from Brown Brothers, Campbell’s ,d’Arenberg, De Bortoli, Henschke, Howard Park, Jim Barry Wines, McWilliam’s, Tahbilk,Tyrrell’s, Wakefield, Yalumba. To know more about this check this out, Australia’s First Families of Wine. When was your last great drive? Experience authentic Muskoka .Golf and stay with your chance to drive away! Spend a day at the race track. All you have to do to be entered is into the draw is to come and stay at the beautiful post and beam Cottages at Diamond in the Ruff situated in beautiful Muskoka on Nutt Lake bordering The Diamond in the Ruff Golf Course. To qualify for the special rates and to be entered into the draw to win you must book by July 1st, 2011. For details and to be entered to win 1-877-643-3343 or Diamond Cottages. Your chance to win and visit a slice of golf heaven! https://www.thewineladies.com/wp-content/uploads/2011/10/s7.addthis.com_static_btn_v2_lg-share-en.gif 16 125 Susanne Seelig-Mense https://www.thewineladies.com/wp-content/uploads/2017/08/WineLadiesLogoTransparent.png Susanne Seelig-Mense2011-06-20 12:00:012011-06-20 12:00:01Thinking of renovating your kitchen? Watch The Wine Ladies TV June 22nd, 2011 2:30-3:30p.m.